The Basque club in red and whites stripes, nicknamed Los Leones (“The Lions”), is alongside Barcelona and Real Madrid the only teams that never been relegated from the top Spanish league. They won La Liga for the first time in 1930 and after that seven times more, making Athletic Bilbao the fourth most successful in Spanish club football. 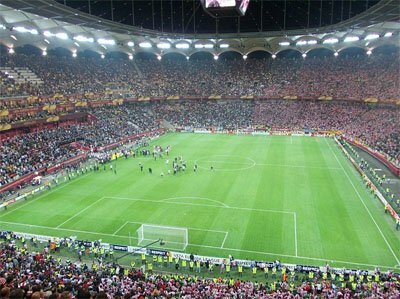 The 2012 final in Europa League against Atlético Madrid. While Athletic Bilbao was officially founded in 1903, its history goes a bit deeper than that. The then-new game of football was brought to the city of Bilbao by two different groups of people – the British shipyard workers and the Basque students returning from their studies in Britain (which is the reason for the English sounding Athletic instead for the Spanish sounding Atlético). Each of these two groups founded their own football club in 1898; it wasn't until 1903 that they decided to combine their forces and settle on a merger that would lead to creation of Athletic Club. Among the Spanish cities, Bilbao is the one with perhaps the biggest football heritage and their club was dominant in the early history of the country. Led by the English manager Mr. Shepard the team won the two first Copa del Rey tournaments, in 1903 and 1904, and make it to the final in the two following editions. It was also in this city the first purpose-built football stadium, Estadio San Mamés, was constructed in 1913. Led by the visionary English coach Fred Pentland, Athletic won its first two La Liga titles in 1930 and 1931. As it turned out, British coaches were somewhat of a good charm for Athletic; the club continued to dominate the 30s (the hammered once Barcelona with 12-1), and after a period with a Spanish manager Pentland returned. Athletic won two more La Ligas in 1934 and 1936, just before the outbreak of Spanish Civil. At this time General Franco enforced a de-Anglicization of the club’s name and the club became Atlético Bilbao for a period. The fans mostly remember the 40s and the 50s for one of the best forwards of that era, Telmo Zarra. Having made his debut in 1941, Zarra led the club to another La Liga in 1943, while, in the process, becoming Athletic's top goalscorer of all time with 251 goals. Funnily enough, Athletic won its next La Liga in 1956, right after Zarra had left the club. After those glory days came a major dry spell, and the club only returned to the top echelon of Spanish football with Javier Clemente's appointment as manager in 1981. His aggressive-minded style proved to be a very effective tactic, and Athletic won two successive La Liga titles (1983 and 1984) under his leadership. The team sometimes played astonishingly physical and especially the matches against Barca were fierce. Infamous is the 1984 Copa del Rey final which included what might have been the biggest scuffle on that level in the game in modern time. The fight that started on the field after the final whistle included flying kicks from some of the players. In the middle of the storm was Diego Maradona – that during the match time had been given a mean treatment from his opponents – for a while turned into a fighter. Since its inception, Athletic Bilbao has adhered to their official policy, which can be summed up in two words – Basque only. In other words, only players of Basque descent were allowed to play for the club. While this tradition is fairly unique in the football world, it did not stop Athletic from becoming a great club; in addition to its eight La Ligas, the club has also won 23 Copa del Rey trophies. The club has also been close to win an international trophy by reaching two final witout winning none. The second time was in UEFA Europa League 2011–2012. After eliminating Lokomotiv Moscow, Manchester United, Schalke 04 and Sporting CP, another Spanish club, Real Madrid, proved too tough in the final. The upper part with the drawing of the logo's inner shield are in some versions in color and in some monochrome. In both versions it pictures the church and the bridge of San Anton plus the Tree of Guernica (by looking close it's possible to see two wolves at the tree trunk). The two wolves remains from the family crest of the Haro's family that was the founders of Bilbao.